This is a different species from the eastern persimmon used in Japan, Korea or other Southeast Asian countries which is known as the kaki. This fruit has a long tradition of being used as a cloth dye for protective measures. Here is a great article on that cultural use, also known as galot. 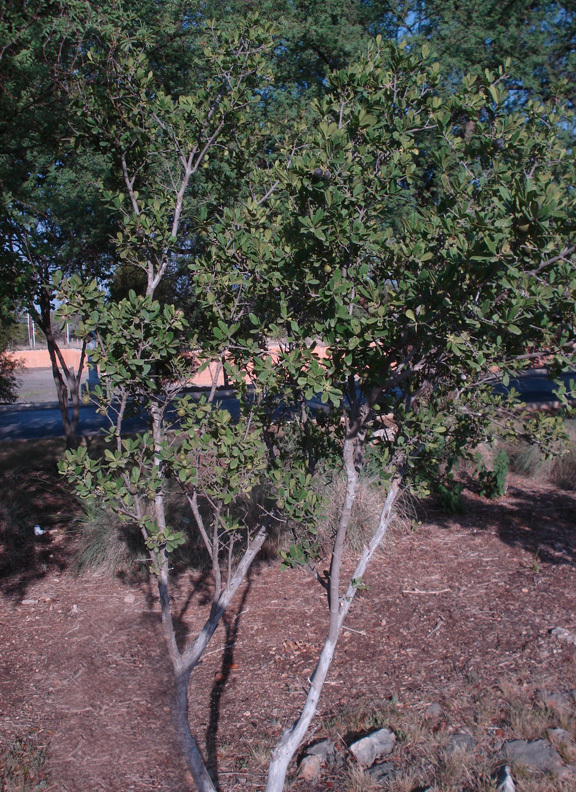 But I digress, I am trying to use the same techniques with our Texas persimmon, same family, most definitely a different species. I am glad to be corrected by a botanist. So far I’ve experimented with both the green and the ripe persimmon. 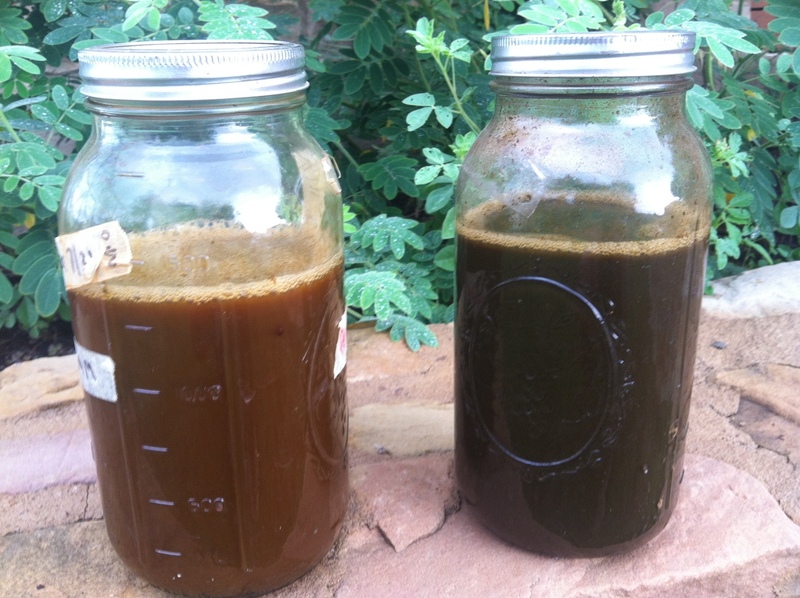 I’ve experimented with increasing the PH, simmering the fruit and also aging the fruit. At this point it seems that the green fruit gives one a yellow toned color and the ripe fruit pushes towards golden brown. So far I have a 1 year old green vintage which I’ve tested with one dip. More to come on that one. I need to test with iron to see how that pushes towards black but last year’s experiment just gave me a golden brown. I am certainly getting a good variety of yellow, gold and amber colors. 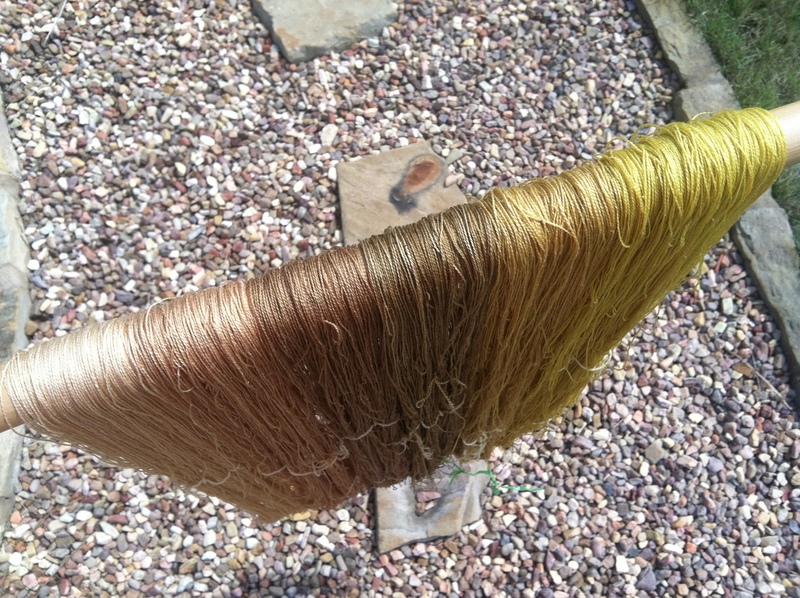 All will make great undertones for over dyeing. 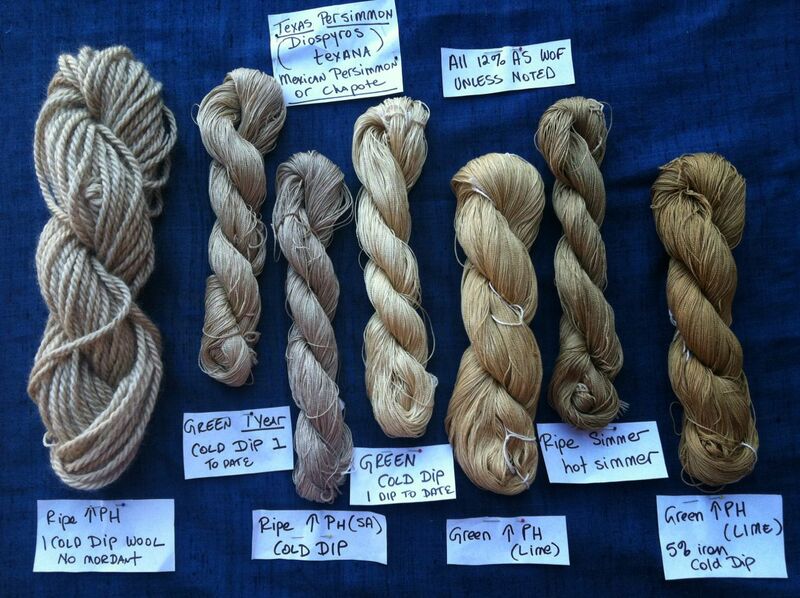 I just need to decide what to over dye them with….agarita, Japanese indigo, madder root, or lichen? One can look at these colors for hours and convince oneself that these are yellow, but if one compares these skeins to the colors produces by cota, agarita and weld one can see how these persimmon colors are all heavily impacted by their tannin content. In other words, there are some beautiful browns, some with a yellow undertone but the brown (tannin) definitely shows. In process today, ripe persimmon with a tablespoon of soda ash added to kick up the PH. 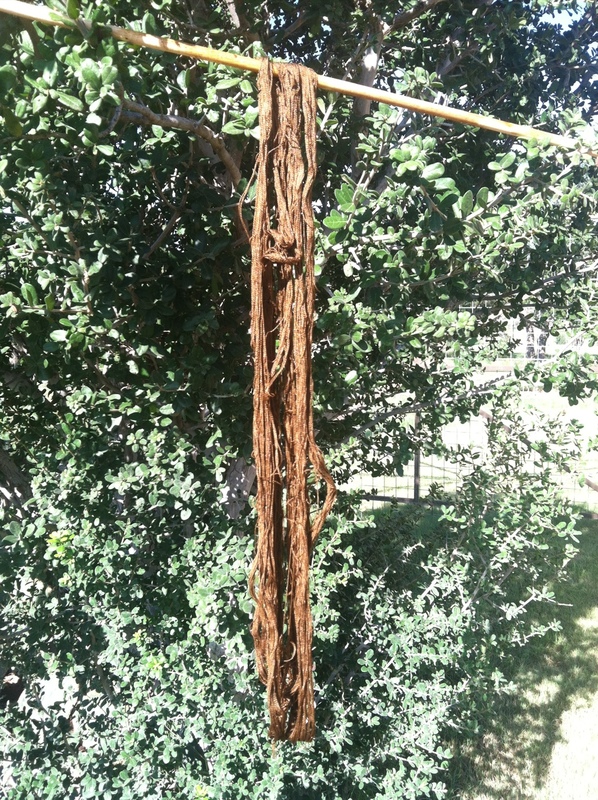 This skein will go thru the cold dye bath several times and oxidize in this nice warm sun. I’m still searching for that elusive black. 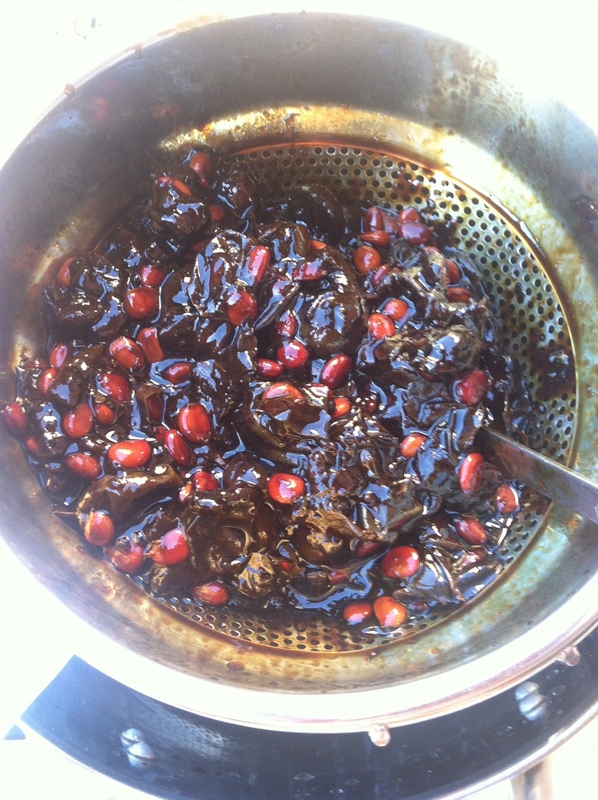 No iron in this dye pot…..yet. I’ve set aside the seed and pulp to save for grinding for another dye pot. 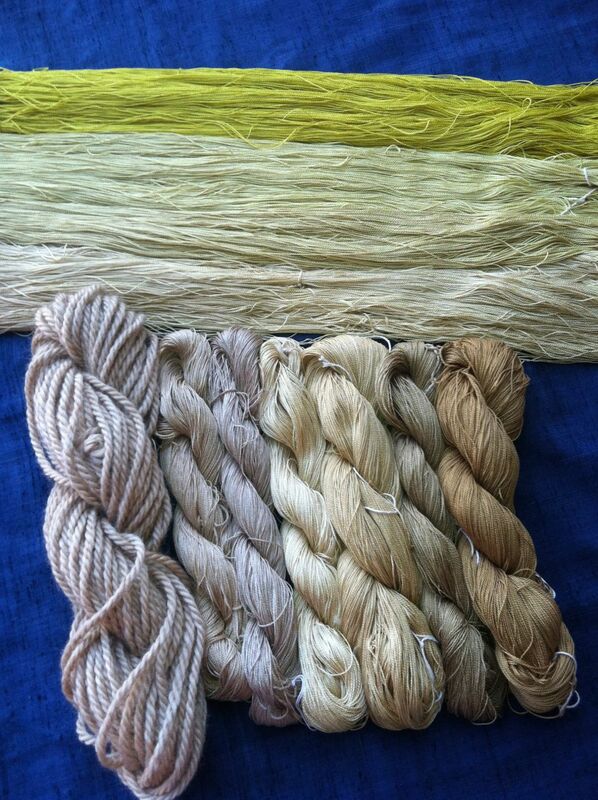 Next up is to overdye one of my Japanese Indigo skeins to test suitability for green shades. The dye skeins are drying before I wash them, this will let the dye bond strengthen. Oak bark with 3 different modifiers on the left. Fresh persimmon in the middle and agarita with two different modifiers on the right. 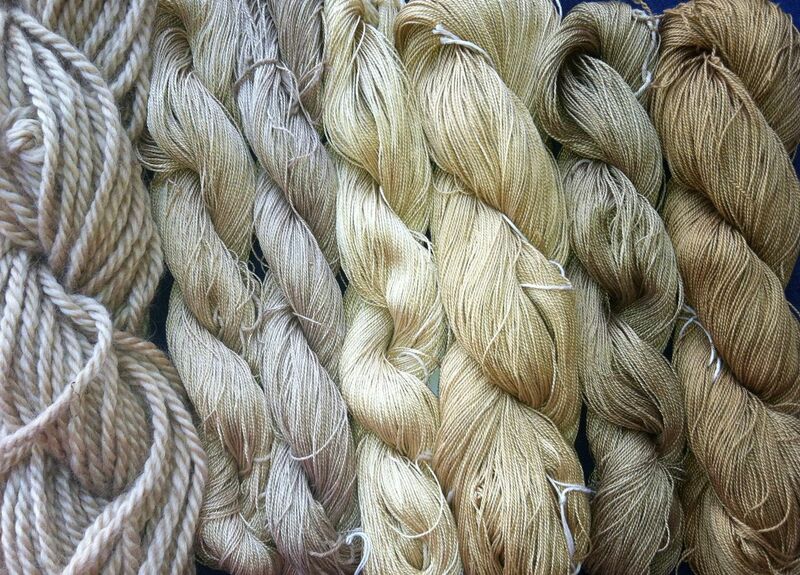 A nice collection of neutrals to over dye or use to push a brighter color in the warp. One of those agarita skeins is bound for the fresh indigo pot today to see how the green looks with indigo over the agarita yellow. Recipes! You know, we are harvesting enough green & ripe persimmons that I think I’ll try making jelly or wine. A good idea from a friend was to pulp the fruit and freeze it. Defrost when needed. 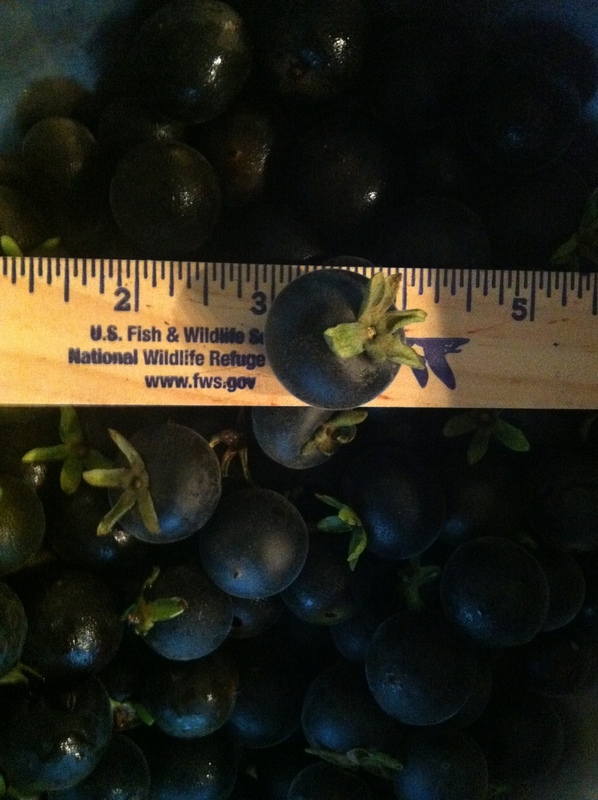 I’ve posted photos of the size of the persimmons and some cross sections as they ripen. I have my 2011 vintage persimmon juice aging. 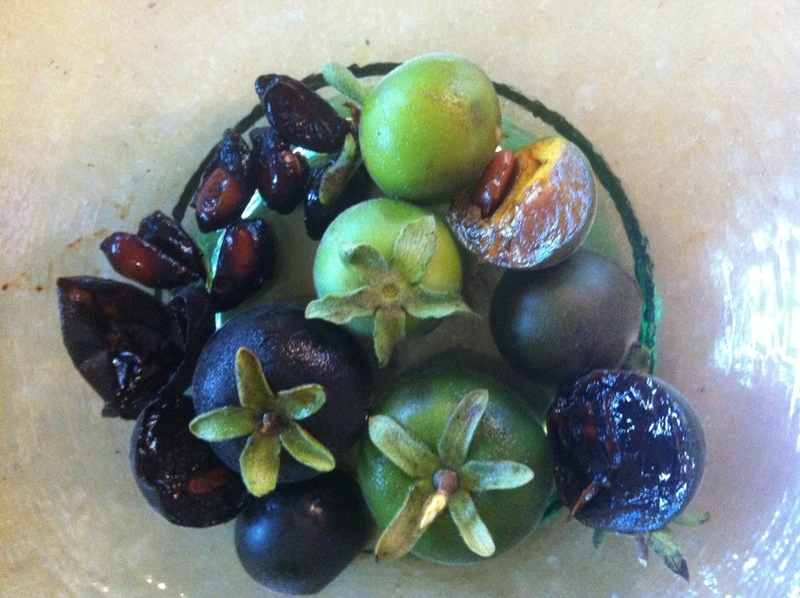 The plan this year is to test the ripe persimmons immediately & after fermentation. The crop looks heavy enough that some will go to the indigo fructose pot also. Vietnam side trip – weaving! Let’s swing over to Vietnam for a moment and take a break from the dye pot. 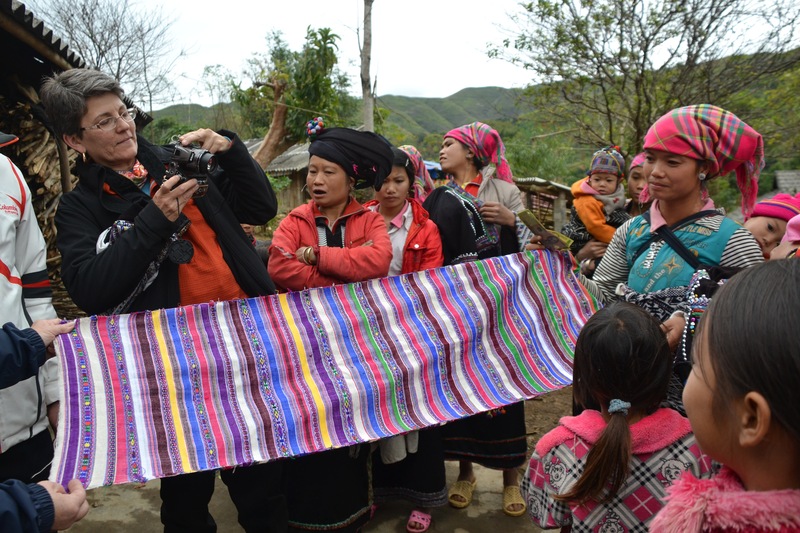 In January 2012 I visited northern Vietnam with Textile Odyssey Tours. The looms, the people and the colorful ethnic clothing were fabulous. I’ve posted some info in my trip journal. Take a moment and glance at the simple looms used to create these colorful textiles. Above are the Lo or Lao people showing me their yardage of ribbons. The white stripes are the dividing lines that are used to cut the ribbons apart for placement in their skirts and jackets. Enjoy! 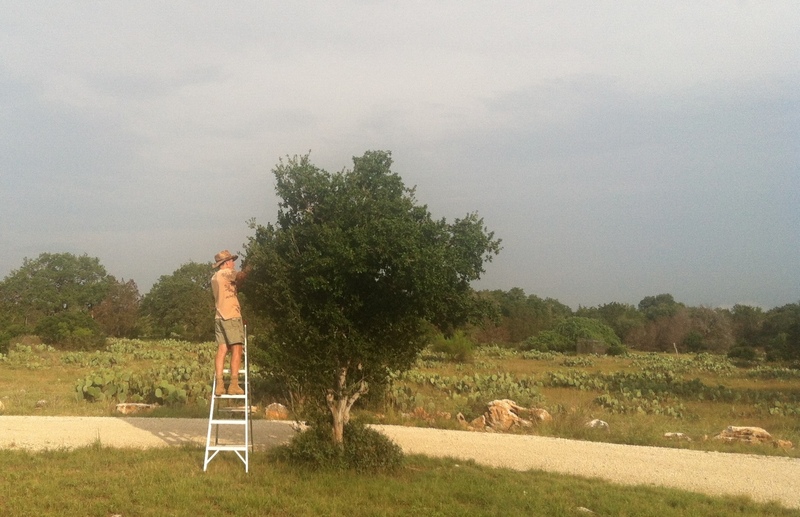 Well, the birds started early but I caught up with them before they took all the ripe persimmons. Over the next week I’ll work hard on sharing the dark purple fruit with my dye pot & the birds. 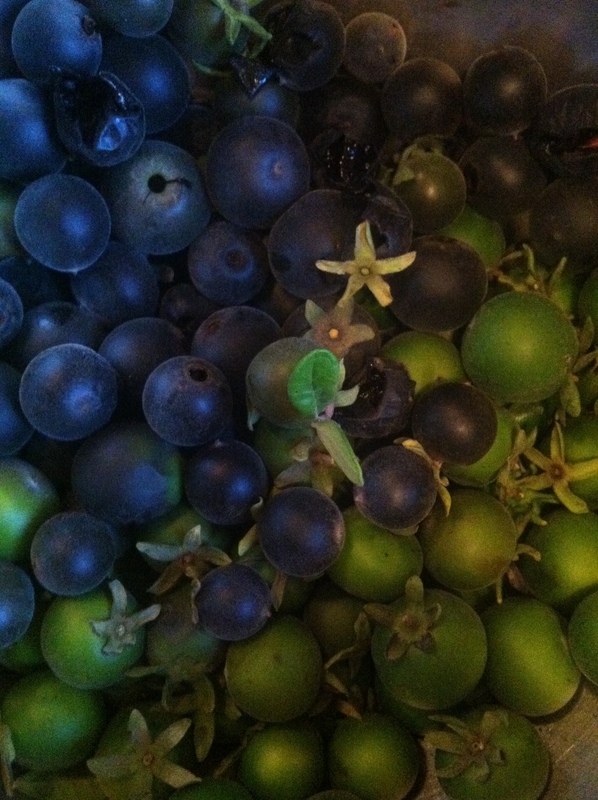 Last year’s gold came from the green and purple blush fruit. This year I’ll experiment with the dark ripened fruit alone to test that color.